Polson’s Carson McDaniel chips onto the green. ARLEE – Senior Rylan Crawford rushed for four touchdowns as the Arlee Warriors won at home with a 50-12 takeover of Troy on Saturday afternoon, Sept. 16. Crawford’s four touchdowns came on runs of 20, 17, 9 and 5 yards, while Will Mesteth added a score on a six-yard run. Warrior quarterback Lane Schall connected with Chase Gardner for a pair of touchdowns of 40-yards and 15-yards. POLSON – A 3-yard touchdown pass from Bo Kelley to Haden Smith in the second quarter were all the points the Polson Pirates could muster up in a 48-6 home loss to the Hamilton Broncs on Friday night. RONAN – Class A No. 1 ranked Dillon Beavers blanked the Ronan Chiefs 47-0 on Friday evening. On Sept. 11, the Ronan Chiefs fell 27-8 to the hosting Stevensville Yellowjackets. The game had initially been scheduled for Friday, Sept. 8 but had to be rescheduled due to the poor air quality caused by local wildfires. POLSON – Jaycee Frydenlund had six digs, six assists and three aces, while Kyler Lundeen added 14 digs as the Polson Lady Pirates fell at home 25-13, 25-16, 25-17 to the Hamilton Broncs on Sept. 12. HOT SPRINGS – The Hot Springs Lady Savage Heat proved too much for Charlo, beating the visiting Lady Vikings 25-21, 26-24, 25-19 in a 14C district match on Thursday. For the Lady Vikings, Kara Tatukivei had a game-high 24 digs and Kaitlin Cox led the team with 13 kills and four aces. ARLEE – This past weekend, the Arlee Scarlets split a two-home game stand with 14C district foes. On Friday, the Scarlets defeated the Noxon Lady Red Devils 25-13, 25-19, 25-16. Eden Morin, Kayla Rieken and Noelle West all had five kills each for the Scarlets. Morin had a game-high 20 digs, while Sydni Rogers posted a game-high 13 assists. The Scarlets lost their first match of the season 25-23, 25-16, 26-24 to visiting Hot Springs on Saturday. Morin had another game-high performance with 19 digs for the Scarlets. Ashley Revis added seven aces and Rodgers had 12 assists for Arlee. FRENCHTOWN – Louetta Conko-Camel scored six kills and 20 digs for the Ronan Maidens in a 25-13, 21-25, 25-15, 25-20 road loss to the Frenchtown Broncs. 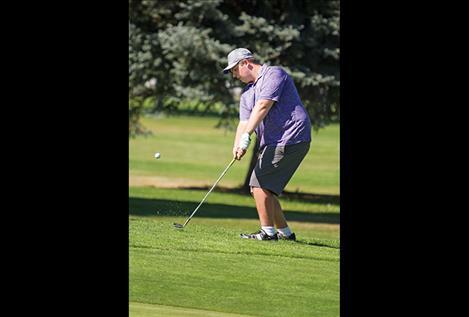 POLSON – Carson McDaniel shot a third place 76 to help the Polson boys win the Polson Invite held at the Polson Bay Golf Course on Sept. 11. The Polson girls team finished second and Ronan’s Brooklyn Olson carded a second place 93. Class A divisional play starts for both Ronan and Polson Saturday in Hamilton. Boys team totals: 1. Polson 315, 7. Ronan 425. Boys top 15: 1. 63 Ryggs Johnston LIB, 3. 76 Carson McDaniel POL, 4. 77 Matt Hobbs POL, 5. 79 Trey Kelley POL, 8. 83 Colby Devlin POL, 14. 91 Anthony Camel RON. Girls team totals:1. Whitefish 426., 2. Polson 440. Girls top 15: 1. 87 Courtney Ockler FTWN, 2. 93 Brooklyn Olson RON, 4. 104 Coli Cannon POL, 7. 110 Esme Yarbrough POL, 9. 112 Amanda Farley POL, 11. 114 Berkley Ellis POL, 14. 120 Madyson Running Crane RON.